If you need professional mattress cleaners in Auckland then we are the area’s leading residential cleaning company for all your needs. Over time, mattresses can get extreme dirt build up, sometimes not visible to the naked eye. Sleeping on a dirty mattress can be damaging to your health and assists germs spreading in your bedroom and throughout the rest of your home. 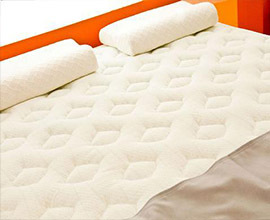 Dirty or poorly maintained mattresses are a heaven for bed bugs which can infest your mattress quickly and be quite uncomfortable if you are bitten. Ensuring your Mattress is cleaned regularly should form part of your regular cleaning routine in your home and we recommend vacuuming every few weeks to ensure dust is removed from the surface and the prevention of bed bugs is greatly increased. Calling in the professionals is necessary every once in a while to ensure that the mattress is deep cleaned and fully sanitised. We provide leading mattress cleaning Auckland wide and will ensure you are left with a fresh smelling, new looking mattress which will be professionally cleaned and sanitised, regardless of its age or condition. If you find that your mattress is in need of a refresh, think you may have a problem with bed bugs, call in the professional Mattress Cleaning in Auckland to get the job done fast! We provide the full service from vacuuming, treating and deep cleaning through to Mattress sanitising in Auckland and will guarantee a job well done! Revive your old, worn or dirty mattress today and give our team a call on 09 950 7177.